A beautiful city rich in history, art, culture, architecture and canals, Amsterdam, if you haven’t been, is a magical place you should add to your bucket list. Its a great walking city with so much to see and do. Try to visit in spring so you can catch the gorgeous tulips in full bloom. 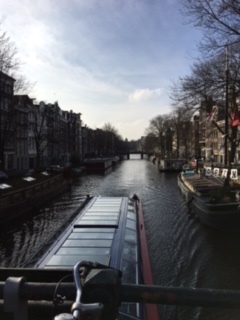 Walking along the canals and viewing the beautiful houseboats is a great way to spend an afternoon. It’s also a great way to build up an appetite. Amsterdam is a melting pot of ethnic cuisine, with a lot of Asian influence, due to it’s history as a major trading port. Although never thought of as much of a food town, Amsterdam is slowly coming into it’s own. One of the wonderful things we noticed on our recent trip was the delicious variety of vegetable-laden dishes offered on many menus. Unlike many eating places, where vegetables take up just a small spot on the plate, restaurants here placed the vegetable front and center. 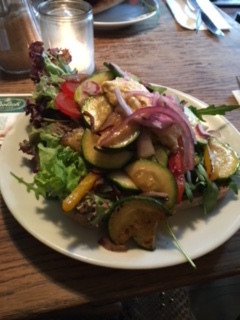 After a beautiful morning visiting the Rijksmuseum and Van Gogh Museum, a delicious lunch was had nearby at Warsteiner, a cute pub that dates from 1753. Order a vegetable omelette and be pleasantly surprised. 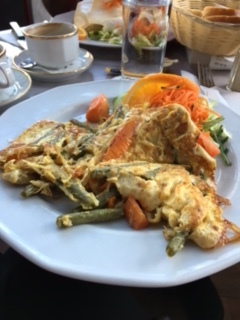 Loaded with an abundance of fresh vegetables and salad, this glorious egg dish was a lovely light meal to fuel lots of walking. For a delightful dinner, I highly recommend Humphrey’s, where the menu is heavy on plant-based fare. 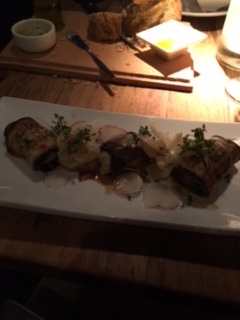 The Eggplant Sushi was terrific. We will definitely be going back there on our next trip. There are also delicious ethnic places to choose from. 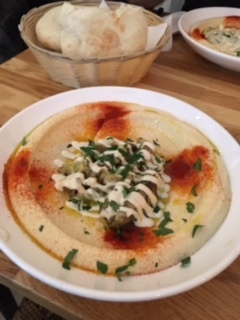 Sir Hummus is a wonderful hummus and falafel spot and a great choice for lunch. Probably some of the best hummus I’ve ever tasted outside of Tel Aviv. Stepping into a tavern to escape the afternoon rain was also another experience for another tasty lunch. Nieuwe Zijde is a cozy wine bar with great food. This delicious Grilled Vegetable Sandwich was a standout. Last, but not least, do try to enjoy a favorite local Indonesian meal known as Rijsttefel, which literally means “rice table.” It’s approximately 44 courses (give or take) of small plates composed of Asian vegetable dishes with chicken, meat, fish or tofu. And served along with a bowl of steamed white rice. It can be quite spicy. If you love Asian food, don’t miss out. And a great place to give it a try is Sampurna. It was such a great experience, to not only explore all Amsterdam has to offer in art and history, but also to savor delicious cuisine. We will be back! Lisa Stollman, MA, RDN, CDE, CDN was recently honored as the The 2015 Outstanding Dietitian of The Year by The New York Academy of Nutrition and Dietetics. She is a speaker, blogger, entrepreneur and innovator who is passionate about spreading the message of healthy eating for optimal health. To help restaurants improve upon menu choices and food preparation, Lisa recently founded Eat Well Restaurant Nutrition where she collaborates with chefs to get healthy meals on the table. She is also the author of the ebook The Trim Traveler: How to Eat Healthy and Stay Fit While Traveling Abroad (Nirvana Press 2014) and the widely-acclaimed The Teen Eating Manifesto: The Ten Essential Steps to Losing Weight, Looking Great and Getting Healthy (Nirvana Press 2012). In her private practice, with offices in Huntington, NY and the Upper East Side of Manhattan, Lisa specializes in weight managment, travel nutrition and diabetes for teens and adults. For more info, contact Lisa via email or visit here. Getting ready to travel abroad for even a few days can be truly exasperating. From making sure your passport is ready to-go, to making sure your hotel (and for some, school courses) is confirmed and any required vaccinations are up-to-date. There are SO many loose ends to pull together, it can make your head spin. But don’t fret. Make a list of what you need to have done, so by the time you get comfortable in your plane seat, all of your to-dos will be checked off. Keeping a list and checking it off as you finish a task will help you reduce any stress. If you want to keep a list online in one convenient place, try the Finish app (available for free) in the Apple store. You can list your “to-dos,” set deadlines, and check them off as they get completed. If you aren’t usually fond of the typical airplane fare, or have special dietary requests, you can order a special meal usually up to 48 hours before you depart. Many airlines will let you order your special meal request online. There’s a vast variety of meal selections to choose from. If you have any allergy or intolerance such as celiac disease, you can be assured that you can find dairy-free or gluten-free in addition to a host of other diet modifications. To find the list of available meal selections, visit your airlines website and do a search for special meal requests. Familiarize yourself with the local cuisine where you will be traveling. Learn the names of popular dishes and what is in them. Becoming familiar with the food will help you when dining in restaurants. You can check the Internet for the cultural foods at your destination country. Then you’ll be aware of the foods offered on local menus, whether you’re grabbing a meal at the hotel cafe or fancy restaurant. It’s also wise to plan ahead and check out the menus online of any restaurant you plan to visit. This way you’ll know if you should make a reservation or find another spot. Especially if you have food allergies or intolerances, you need to be informed in advance of the local cuisine and the potential allergens or ingredients it may contain. Quite often when we are overwhelmed with just the thought of travel, we somehow forget about the food. You don’t want to get to the airport and take for granted that you will get a delicious meal served to you inflight and will find all the foods you love at home, when you get to your destination. So what should you do? Plan ahead! Staying well-fueled with good food will keep you feeling healthy and energized. 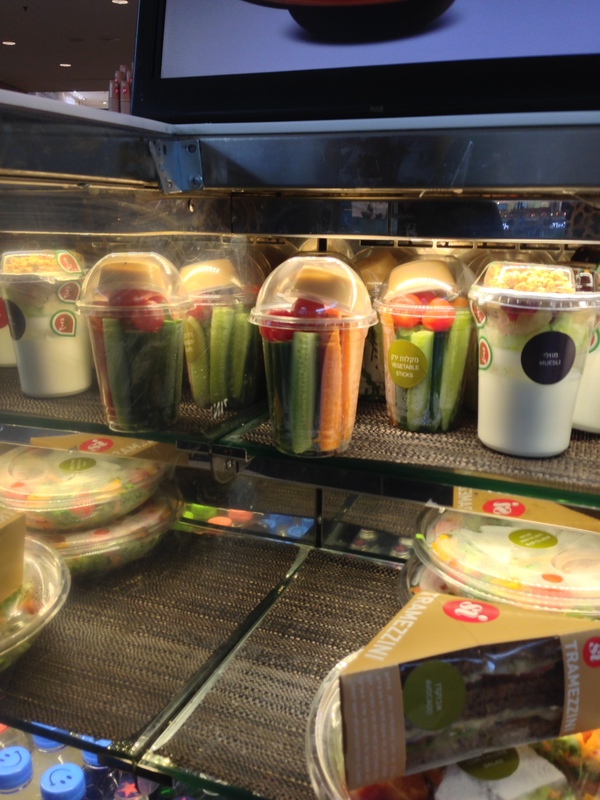 Buy some healthy foods that are portable to bring along with you on the plane. Healthy granola bars, such as KIND or Kashi, are great for a snack or have two for breakfast! Bags of nuts and dried fruit are also good choices. Trader Joe’s sells large bags of individually-wrapped trail mix that’s great for traveling abroad. You can also pack a couple sandwiches for the flight. Peanut butter and banana on whole grain bread is a healthy sandwich to bring along. Also hummus, avocado and tomato on whole grain bread is delicious and quite portable. Traveling makes healthy eating a bit more challenging. Whether you go by car, train or plane, when you aren’t in your normal environment, it’s just easier to get off track and forget about your meal routine. And while you shouldn’t try to lose weight when on vacation, you don’t want to backtrack either. So taking a few minutes to pack snacks for your trip will help prevent you from stopping at the corner stop for a candy bar or pulling into the fast food lane for a milkshake and fries. That being said, some convenient stores and airport vendors do have healthy snacks to choose from. You just have to choose wisely. Here are a few suggestions for healthy snacks to bring along on your trip. Nuts: Great source of healthy omega-3 fats, fiber and plant proteins. Nuts are also calorie dense, so just a small handful (1/4 cup) can be pretty satisfying and hold off your hunger for your next meal. Choose any kind you want- roasted peanuts, almonds, walnuts, pistachios, sunflower seeds, etc or make a variety pack. Measure them out and put in baggies. Fresh Fruit: Choose less perishable fruit, such as bananas, grapes, apples, plums and apricots. Fruit is hydrating, full of nutrients and low in calories, so it can be a good way to satisfy the munchies that pop up during a long trip. Raw Vegetables: Great for a road trip. If you can bring along a cooler, pre-wash and cut veggies such as radishes, carrots, fennel and celery. Place all in a plastic bag and put on ice. These make a great dipper for hummus or homemade ranch using plain Greek yogurt instead of sour cream. Popcorn: Popcorn is actually a whole grain. Pop up a batch and flavor it yourself with garlic powder, onion powder,rosemary, oregano, pepper, sea salt or even hot sauce for a kick. Or to keep it simple, pick up the 100 calorie bag servings at the grocery store for built-in portion control. Trail Mix: Make your own! Mix together a whole grain cereal such as Wheat Chex or plain Cheerios, nuts, dried fruit and dark chocolate pieces. Place in individual baggies.. This snack doesn’t require refrigeration so can last the length of your trip. Energy Bars: Choose those with few ingredients, low in added sugar ( 6 or less grams of sugar per serving), contain some protein (more than 3 grams) and fiber (at least 3 grams per serving). Kind Bars and Lara Bars are excellent choices because they are satisfying, tasty and contain more “whole food” ingredients. If you don’t pack ahead, good news! Most of the aforementioned items can be found at most convenient stores or airport vendors. Happy snacking! Lisa Stollman, MA, RDN, CDE, CDN is an award-winning Registered Dietitian Nutritionist, author, blogger and speaker. She the author of the new ebook The Trim Traveler: How to Eat Healthy and Stay Fit While Traveling Abroad (Nirvana Press 2014) and The Teen Eating Manifesto (Nirvana Press 2012.). Lisa is the recipient of the 2015 Outstanding Dietitian of The Year from The New York Academy of Nutrition and Dietetics. Her expertise includes teen and adult weight management, travel nutrition and diabetes. Lisa loves to ignite passion in her clients for the taste of delicious and healthy plant-based foods. She consults with clients in Huntington, New York and on the Upper East Side of Manhattan. To find out more about Lisa or to schedule a nutrition appointment, please visit here. 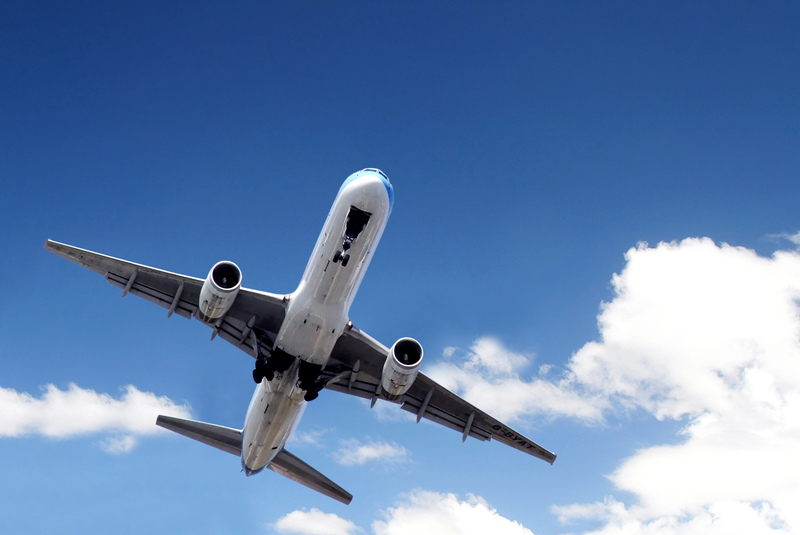 One of the great things about traveling is that it can help you escape your daily routine. It’s great to explore new places and leave the usual daily grind behind. And feeling great while you travel is a no-brainer. Feeling well will help you enjoy everything your destination has to offer. If you want to have a stress-free vacation and come back home feeling relaxed, planning out most of your trip in advance can make things run smoother. Booking train and museum tickets will help you spend less time on line. And the play you were dying to see–you don’t want to find it’s now sold out when you drop in to buy tickets. Restaurants that you definitely want to try? Book your reservation on Opentable before you leave home. In addition to the “before you start your travels” tips, there are a wide range of health-related apps to help make your trip a great success. Using apps available on your smartphone when you travel can definitely enhance your travel experience. Here are some TOP apps to help you eat healthy, stay fit and feel sane while traveling. Enjoy your trip and come back home feeling healthy, relaxed and energized! Bon voyage! – Happy Cow (free for iPhone): Essentially a “Yelp” for meat-adverse diners – gives options for vegan, vegetarian, and vegetarian-friendly restaurants in your area, rates them by price, and details the type of food and what animal products are offered/omitted. Provides reviews and pictures, so you can browse the menu and decide on what you want on the ride over! -Eat Out Well (free for iPhone): From The American Diabetes Association and Hope Warshaw, RDN. Excellent app for searching menu items and their nutrition facts at multiple chain restaurants across the U.S.
– Food Tripping (free): This app finds your location (in America) and gives you suggestions on healthy food places around you. You can search for Farmers Markets, coffee and tea places, food and drink artisans, eateries, and juice joints. You never have to settle on a fast food salad again! – My Fitness Pal (free): This app is also very helpful to research calorie counts on popular foods and recipes from other cultures. Calorie counts are verified by their Registered Dietitian, so you know that what you enter into your food log is guaranteed to accurately keep you on track! – CDC’s Travwell (free): Looks at different countries around the world and offers traveling suggestions to be the healthiest as possible for your trip. This includes vaccinations and medicine advice, and lists of over-the-counter medicines and first aid supplies. This is super helpful to stay on track with eating healthy during your vacation, because the better you feel, the more motivated you’ll be to stay healthy the whole trip! – Can I Eat This? (free): This is an app also created by the CDC that helps prevent contracting a food borne illness in an international country. By being ahead of potentially debilitating symptoms, you can stay healthy with smart food choices and lots of walking around your city! -Insight Timer (free for iPhone) Unwind with this meditation app. A variety of guided meditations to choose from. Select the length of time you wish to meditate. -Simply Yoga (free for iPhone) A variety of yoga exercises with audio and instructor. A great way to start or end your day. -MapMyWalk and MapMy Run (free for iPhone) ) Whether walking or running, these apps will keep track of your route, speed and distance. -Track Your Steps: iSteps ($0.99) iPhone Works like a pedometer! Counts your steps, distance, average speed and calories burned. You can wear it around your waist or carry it in your hand. Great and easy way to get fit so press start and get moving! -7 Minute Workout (free for iPhone). Quick and effective full-body workout that only takes seven minutes to complete. Great for travelers! Lisa Stollman, MA, RDN, CDE, CDN was recently honored as the 2015 Outstanding Dietitian of the Year by the New York Academy of Nutrition and Dietetics. Her passions include traveling the world and experiencing new foods and cultures. She is the author of the ebook The Trim Traveler: How to Eat Healthy and Stay Fit While Traveling Abroad (Nirvana Press 2014) and The Teen Eating Manifesto: The Ten Essential Steps to Losing Weight, Looking Great and Getting Healthy (Nirvana Press 2012).. Lisa maintains a nutrition practice in NYC and Huntington, Long Island. Lisa is also the CEO of Eat Well Restaurant Nutrition where she collaborates with chefs to get healthy dishes on the menu. For more info on Lisa, visit here. Special thanks to Samantha Marks, BS, DTR for her input on this post.